Are you happy with the way you present your image? Does your office, home and vehicle clearly show you at your finest? If not, HERE WE ARE. At Toronto based Window Tinting Services, we are experts in providing Decorative Window Treatments that will present you at your best and satisfy all of your decorating needs. By treating any window, door or room divider with our Decorative Window Film, you can make the statement you want. No matter how bold or subtle you wish to be, patterned or plain, vivid or muted in color or style, we will enhance your image through our large selection of shapes, patterns and/or colors. Simple or complex, You choose, and We deliver. Customize your look, present your best side. For your corporate needs, feature your logo where it will be of most benefit, enhance your signage to present you at your best. Take a step up. Your business depends on it. 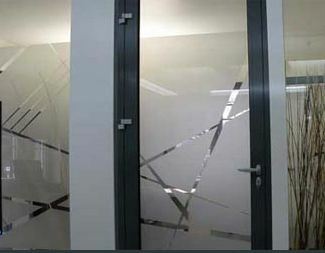 Many businesses use etched glass for more privacy and enhanced looks. While attractive and more private, this glass is very expensive to produce, install and maintain. And once installed, it is very expensive to replace, whether in the case of an accident, deliberately damaged, or if a new look is desired. Our decorative and Privacy Window Film gives the same effect, but has substantial advantages, including reduced cost, ease of manufacture, and fast, professional installation. This Etched Glass Alternative has the same high quality look, but with a lot more flexibility and at a more economical price. And if you ever want to change it out for a new look, it is easy to remove and replace with another privacy window film. The advantages of Frosted Window Film are apparent on nearly every commercial or Residential Window Film job, but are even more apparent in commercial applications where signage or presentation need to be varied often, such as with leased spaces and storefronts. Our Frosted or Sandblast Window Film is easy to maintain using ordinary glass cleaner, just like a window. In addition to presenting a great look, our Residential and Commercial Window Film varieties help provide privacy through a frosted or sand blast look with the added advantage of providing security against break-ins or in disasters where flying glass could be a problem. These benefits are useful in home and vehicle applications as well as commercial situations. Decorative window films go by the names: Frost Window Glass, Frosted Window Film, Sand Blast or Etched Glass. Here at Window Tinting Services, we offer a full-service/one stop solution to all you glass needs, including our Window Tinting School for those who wish to develop their own businesses. We have decades of experience and a wealth of satisfied clients. You will be one. Come to us, we will help you. Contact us now and improve your situation. Free estimates and clear, honest, personable guidance. Now is the time to make things better. You deserve it.